You know how important a great charge controller to an off-grid energy system—it can make the difference between batteries that work well and last a long time, or ones that die quickly. We’ve chosen charge controllers that protect your batteries and maximize the energy harvested. You can trust Zonna Energy as your solar energy equipment supplier—we’ll help you find the right solution for every situation! You can count on Schneider Electric to deliver sleek and streamlined products that are as innovative as they are easy to install! Their MPPT charge controllers are no exception. The SE Conext 80 600 has integration features that eliminate the need for PV combiner boxes and DC circuit breakers, keeping costs low. Its shade-tolerant MPPT algorithm also yields more energy. They’ve tested its reliability with MEOST—so you can know it will hold up under tough conditions. 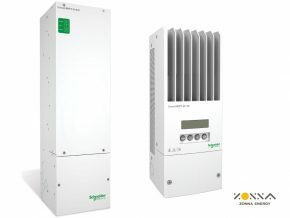 If you’re installing Conext solar inverter charger sytems, the SE Conext 60 150 integrates perfectly with them, although it can be utilized separately without a problem. This charge controller extends battery life with their selectable multi-stage temperature compensated charging, while still delivering the maximum available current from the PV array and batteries. As with their other products, you can monitor their charge controllers remotely to track performance or troubleshoot issues. Whether you need a small charge controller to regulate a few outdoor lights, or a full-system charge controller for a large PV array, Magnum Dimensions has the size you need, from 6 amps to 100. They seek to be cost-effective—offering both PWM charge controllers with low self-consumption, as well as larger MPPT controllers with highly efficient algorithms to regulate PV current and battery voltage. Their larger CC-30 and CC-40 PWM charge controllers also feature an easy-to-read LCD display. These allow you to change operating modes and monitor state of charge, voltage, and current. MidNite Solar provides charge controllers that offer amazing versatility in their compatibility with different renewable energy inputs (solar, wind, or hydro power), as well as adapting to harsh or volatile environments. 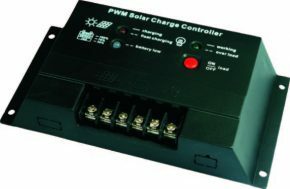 Their PWM Brat charge controller, while only regulating up to 30 amps, is great for running small off-grid systems in remote areas—keeping pumps, lighting, and fencing in working order and even featuring its own solar clock! Their MPPT controllers can also stand up to rough environments. The Classic series are the only controllers in the industry rated by the ETL to work with solar, wind, or hydro power supply. (If you want only the solar power regulation, the SL-50 works very well for that.) They offer a 5-year warranty, with an additional 2 years available if you send the system back before then for inspection and repair. The KID series is particularly well-suited for marine environments, safely operating where there may be flammable gases and with rigorous vibration, environment, and thermal requirements. 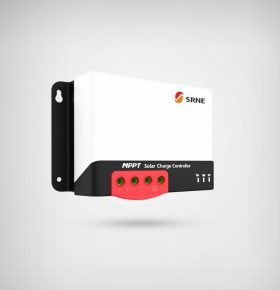 SRNE Solar offers three series of PWM charge controllers, each of which comes with digital displays that are intuitive to use, applies regular equalizing charges to extend battery life, and provides protection for overcharge, over-discharge, overload, short-circuit, and reverse polarity. This solar charge controller manufactuer invests proactively in research and development, which is why they’ve become a trusted global manufacturer of solar charge controllers—and one of Zonna Energy’s go-to sources! Their SR-HP series works with sealed, GEL, flooded lead-acid batteries and lithium batteries, and can be monitored through computer software or a phone app through its RJ12 data port. The SR-LM series, with its different four working modes, is excellent for street lamps or other monitoring devices with varying power needs. Finally, their SR-HM series features USB outputs to charge phones or other electronic devices in the event of a power outage or in remote areas. If you are looking for controllers with higher energy conversion, SRNE Solar has two MPPT charge controller series. They estimate these use energy 20% more efficiently than PWM controllers, while offering a 99.9% MPPT tracking efficiency, and a 98% circuit energy conversion efficiency. Each controller also features digital displays that make it easy to monitor and adjust settings. The SR-MC series has a unique PowerCatcher technology to give you a quicker, more efficient response rate and tracking. The SR-ML series offers historical data on all controllers for up to a year, and up to 5 years on select devices. Solarland USA offers a range of solar charge controllers for various off-grid systems, with both PWM and MPPT options. We carry both of their PWM charge controller product lines. For home PV systems or other small stations, the NR series provides industrial-grade performance and reliability, regulating 12V/24V supply. The GP series can be used for a variety of systems, with a settable operating mode of load and remote monitoring and control. Their MPPT product line has charge controllers that work with a variety of batteries (lead acid, AGM, Gel, sealed, flooded, and lithium) to power all sorts of applications, while enhancing charging efficiency by up to 30%. 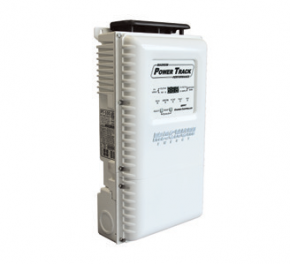 They also offer industry-leading boost controllers, which increase power supply up to 48V and are produced in a marine-grade casing, suitable for use in outdoor environments. Looking for a solar charge controller supplier located in North America that offers competitive pricing and quick delivery, while supplying you with the most innovation in renewable energy products? You’ve found the solution in Zonna Energy! Don’t wait—you can count on Zonna Energy to answer whatever questions you have. We aim to be your number one choice for an MPPT solar charge controller supplier. Ready to discuss a project with us or the product lines your company needs? If you’re looking be any of the following: Inverter, Charge Controllers, Solar Panels and trojan battery distributor. We’re ready to help! Call us at (330) 674-1750 during normal business hours.